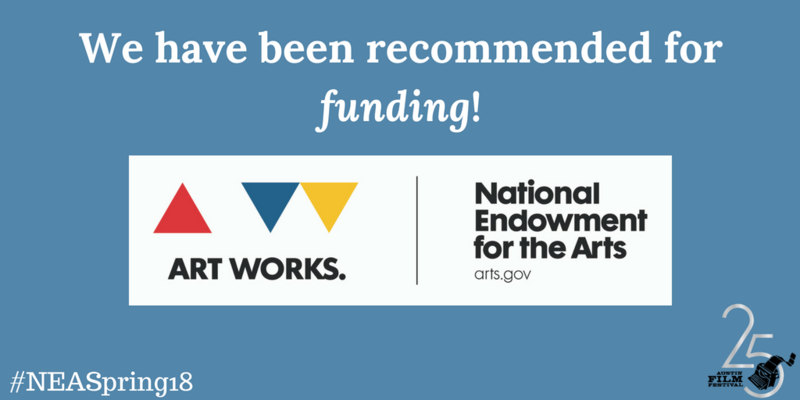 Austin, TX —National Endowment for the Arts Chairman Jane Chu has approved more than $80 million in grants as part of the NEA’s second major funding announcement for fiscal year 2018. Included in this announcement is an Art Works grant of $15,000 to Austin Film Festival for the On Story® Project. The Art Works category is the NEA’s largest funding category and supports projects that focus on the creation of art that meets the highest standards of excellence, public engagement with diverse and excellent art, lifelong learning in the arts, and/or the strengthening of communities through the arts. 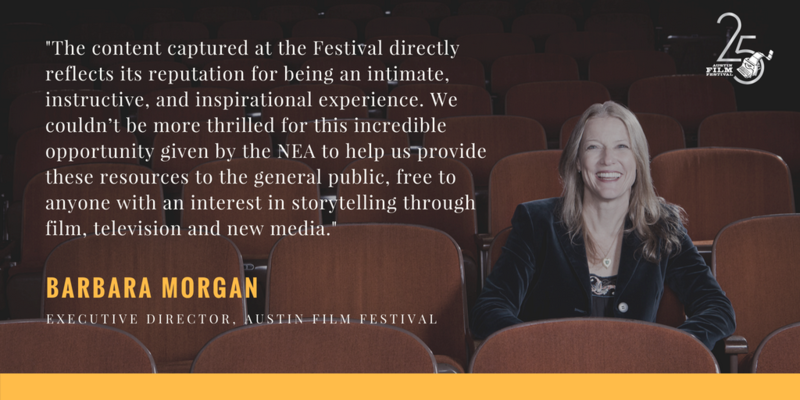 Austin Film Festival & Writers Conference (AFF) was the first organization of its kind to champion the writer’s role in film and television, and has remained vigilant in its dedication to storytelling throughout its 25-year history. The organization programs a slate of year-round offerings, including panels, workshops, and film screenings, all rooted in the art and craft of narrative storytelling. Held each October, its annual Festival and Conference is renowned to be the largest screenwriters event in the world, boasting over 200 panels and panelists gathered to discuss their expertise, latest works, and the inner-workings of the industry. AFF’s annual Festival and Conference is a unique experience, challenging standard panel and film Q&A conventions by delivering intimate, instructional, and inspiring content to its audience. The AFF and On Story teams work year-round to create a program rich with insight. Speakers have hands-on experience and the battle scars to prove it. Panels, workshops, and interviews are tactile, ranging from detailed explorations of a script’s journey from conception to completion, to discussions that feature an entire writers room staff. Each session strives to pull back the curtain on the creative process, offering an inside look at some of the most influential and inspirational projects of our time. Since its inaugural year in 1993, AFF has recorded and preserved these distinctive events. The vast material captured at the Festival and year-round events is then curated into productions offered for free online and through public radio and television; preserved and archived at The Wittliff Collections at Texas State University; and edited into a multi-book series in partnership with The University of Texas Press. These elements make up the foundation for the On Story brand and content. An extension of AFF’s programs, mission, and messaging, On Story offers inspiring and instructional curations from the entertainment industry’s leading writers, directors, and creatives. The process of selecting specific episodes and content to feature in On Story is meticulous. At the close of each Festival year, the On Story team conducts a robust review process. These detailed deliberations help inform the content selection for the upcoming On Story season. Along with catering to both trends in the industry and the more timeless storytelling topics, the producers consider diversity of both speakers and mediums represented; the impact of the project’s educational value; and how the human experience is highlighted through the art and craft of storytelling. On Story’s productions – 20 half-hour television episodes; 32 one-hour-long radio episodes; and 30-50 one-hour-long podcast episodes, all selected from a pool of over 200 recorded sessions from the prior year, as well as the book series, archive, and website – exude the same vibrance as when they’re being recorded, but are more wide and democratic in scope. The productions include industry luminaries such as Mark Frost (Twin Peaks) , Greta Gerwig (Lady Bird), Vince Gilligan (Breaking Bad), Issa Rae (Insecure), John Singleton (Boyz n the Hood), Keenen Ivory Wayans (In Living Color), and Alan Yang (Master of None). The Project as a whole has developed organically as a way to expand AFF’s reach, giving unprecedented access to audiences who have the desire to learn more about the art, craft, and business of film, television, and new media. As it does for AFF’s attendees, who often return year after year, On Story has proven to be an integrative resource to a nationwide classroom of students who, in turn, possess the potential to become writers, filmmakers, and media creators themselves. Austin Film Festival (AFF) is a non-profit organization dedicated to furthering the art, craft and business of writers and filmmakers and recognizing their contributions to film, television and new media. AFF champions the work of aspiring and established writers and filmmakers by providing unique cultural events and services, enhancing public awareness and participation, and encouraging dynamic and long-lasting community partnerships. AFF is supported in part by the Cultural Arts Division of the City of Austin Economic Development Department and the Texas Commission on the Arts. All attendees and events are based on permitting schedules and are subject to change and/or cancellation without notice. For media credentials, please contact Samantha Levine at marketing@austinfilmfestival.com. Badges and passes are available for purchase online at www.austinfilmfestival.com or by phone at 1-800-310-FEST.